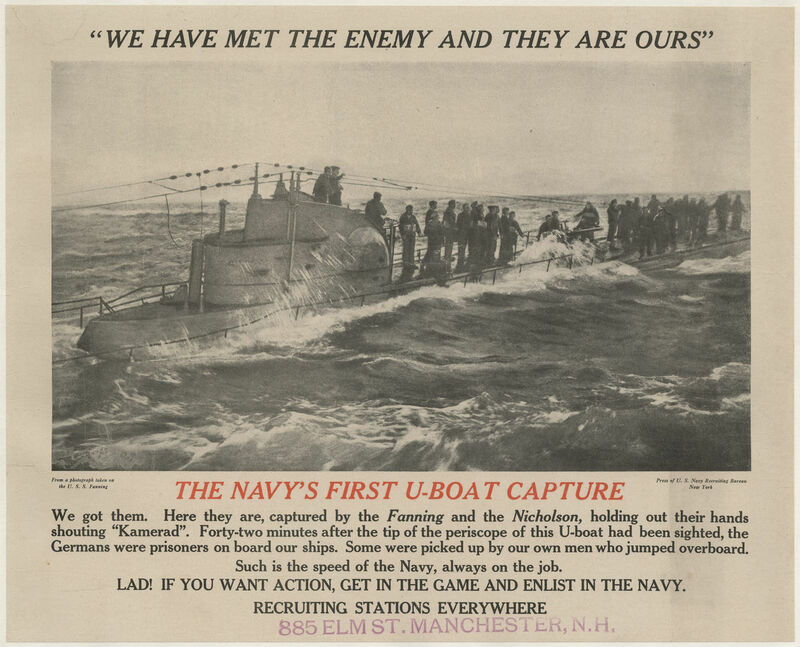 Inscription(s) : Texte de l'affiche : "We have met the enemy and they are ours ; The Navy's first U-boat capture ; We got them. Her they are, captured by the Fanning and the Nicholson, holding out their hands shouting "Kamerad". Forty-two minutes after the tip of the periscop of this U-Boat had been sighted, the Germans were prisoners on board our ships. Some were picked up by our own men who jumped overboard. Such is the speed of the Navy, always on the job. Lad ! If you want action, get in in the game and enlist in the Navy"
Note d'exemplaire : Cachet "885 Elm St. Manchester, N[ew] H[ampshire]." Note de provenance : Fonds additionnel de la Guerre. Acquisition 2015.